Q Can we adjust the direction of the lights? If so, how much (45 degrees, 30 degrees)? Also, do the lights rotate? Basically, I'd like to use this product to light an entire kitchen and if the lights pretty much just point down, that won't work. A The Kichler Lighting Fixed Rail 4 Light Rail Light 7704OZ can be adjusted up to 45 degree angles. The lights cannot be rotated though. 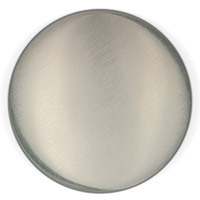 A The Kichler Lighting Fixed Rail 4 Light Rail Light 7704OZ requires a 50W MR16 bulb. If you wanted to use an LED equivalent to that bulb you would be able to. 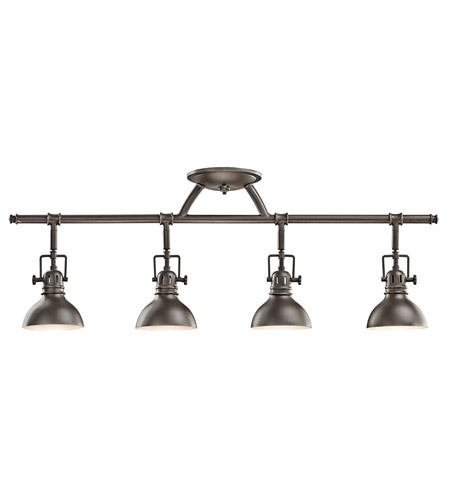 The fixed rail collection is only available up to a 4-light. Q The mount for this light is on a slanted ceiling. Will this fixture work? 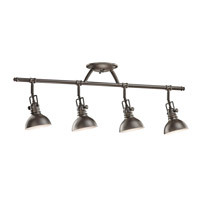 A The Kichler Lighting Fixed Rail 4 Light Rail Light 7704OZ can not mount on a sloped ceiling.